During the late 17th century Vauxhall Gardens (or New Spring Gardens as it was then called) was little more than a country ale house, but in 1729 it was taken over by Jonathan Tyers who transformed it. 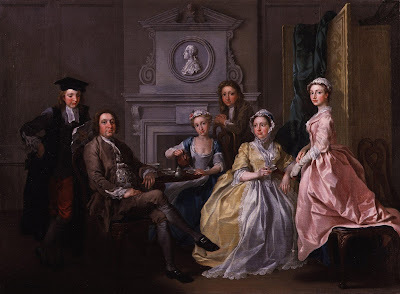 And central to Tyers' transformation was the use of art, with decorations by major artists such as Francis Hayman and William Hogarth, Roubiliac's famous statue of Handel and of course music itself. As far as Tyers seems to have been concerned it wasn't just window dressing, the arts were morally redemptive, a civilising influence in a chaotic world. 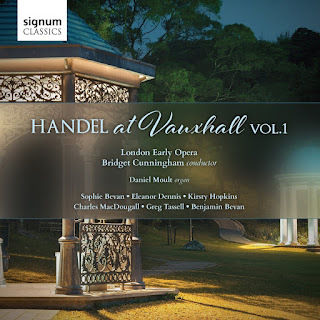 But the modern view has a tendency to focus on Vauxhall's social charms and be rather dismissive of the music performed, this new disc is something of a corrective. Thomas Arne, who lived next door, was the in-house composer but there seems to have been a close relationship between Handel and Tyers, and Handel's music featured strongly in the programmes. An organ was installed in 1737 and gradually the musical programmes became formalised, and the certainly seem to have included rather more significant music than we give them credit for. This disc contains the recreation of something like the first half of a programme at Vauxhall. We open with the sinfonia from Handel's Acis and Galatea, a suitable pastoral start in a delightfully engaging and breezy performance with some fine oboe playing from Belinda Paul and Ann Allen. A short organ improvisation, in the style of Handel and John Worgan (Vauxhall's in-house organist) leads to Handel's Organ Concerto Op.4 No. 2 in B flat Major. A stately sinfonia introduces a perky Allegro, where the very soft-grained tone of the organ contrasts with the livelier string sound, the whole having a rather galant feel. A short Adagio e staccato movement has rather mysterious veiled tone, whilst the work concludes with a grace Allegro ma non presto. We probably can never know exactly what Handel's organs sounded like, so it comes rather down to personal taste I have to confess that I found the organ tone a little too understated here, which is a shame because Daniel Moult makes a very stylish soloist. Next soprano Kirsty Hopkins sings the accompagnato 'Ye verdant plains and woody mountains' and air 'Hush, ye pretty warbling choir!' from Acis and Galatea. The organ at Vauxhall was an essential part of the orchestral make-up, not just in the concertos. It featured a 'symphony or singing birds', but lacking this (no English organ has survived with such a mechanism), London Early Opera add the sound using a bird whistler. The result is charming, and complements Hopkins fine performance with a clear expressive line, combined with good words and great charm. 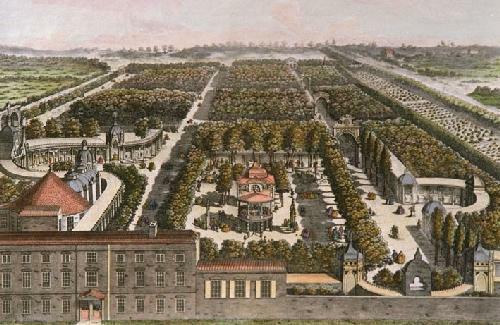 Thomas Arne's delightful pastoral, Colin and Phoebe was a Vauxhall favourite. Sung here by Eleanor Dennis, Greg Tassell and Benjamin Bevan, it has a galant charm, this is very civil music making, and certainly non-neligable. Programmes at Vauxhall were always full of high contrast, and next comes the Dead March from Handel's Saul. Many of the instrumentalists in the orchestra doubled on various instruments, so the fact that this piece requires trombones (sackbuts) would not have been a problem. Bridget Cunningham and her forces give it a sober grandeur with a very soft grained sound. Two Handel songs come next. The Advice was printed in The Muses Delight (1754) and uses a melody from Handel's opera Ezio but with lighter, English text, whilst The Melancholy Nymph was written by Handel in 1715 and first performed at Drury Lane Theatre. Sophie Bevan is elegant and stylish in The Advice, though Charles MacDougall sounds a bit distant in The Melancholy Nymph, and neither really gets the words over. John Hebden was principal cello and second bassoon a Vauxhall in the 1740s and 1750s, as well as playing for Handel's annual performances of Messiah at the Foundling Hospital. He produced his six Concertos for Strings and Basso Continuo in the late 1740's and the first concerto from the set, in A major is the penultimate item on the programme. It is in four short movements (slow, fast, slow, fast) with the organ quite prominent in the texture. The opening Adagio is quite conventional but has not a little style, the Fuga is lively with a surprisingly jaunty theme, the Largo is quite a gentle movement leading to a lively Allegro full of bouncy rhythms. The programme concludes with the final duet from Handel's L'Allegro, il Penderoso ed il Moderato, 'As steals the morn upon the night'. In her programme note Bridget Cunningham talks about how the Arcadian delights of Milton's two poems inspired Jonathan Tyers in his vision of Vauxhall and in fact Roubiliac's statue of Handel was complemented with a statue of Milton. Soloists Eleanor Dennis and Greg Tassell bring the programme to a delightful and characterful conclusion. 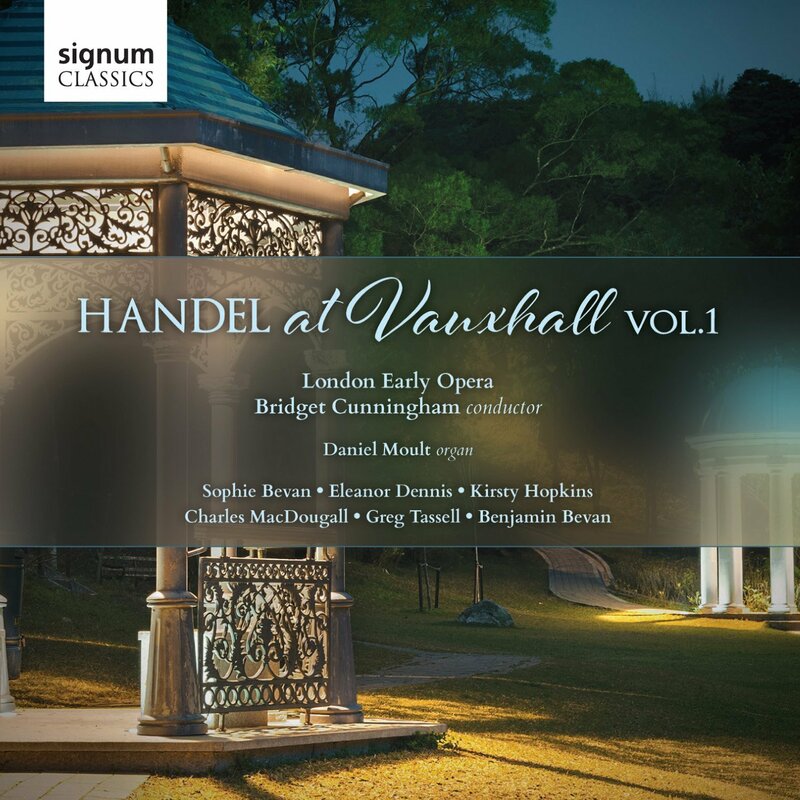 The disc is accompanied by an admirable trio of articles by David E Coke and Bridget Cunningham, giving full background to Vauxhall Pleasure Gardens and its music, as well as the individual pieces. At 50 minutes, the programme is perhaps a little short but we are promised a second volume in the series. The programme on the disc sheds some illumination on the types of music enjoyed at Vauxhall in its heyday, with the combination of styles, mixing dances and songs with more solemn music. Bridget Cunningham in her article talks about the contrast between Apollo (sophisticated lyre playing) and Marsyas (rustic pipes), which was a popular subject at the time. It helps that she and her performers give the music with such winning and engaging performances.